The best white wine vintage in the Okanagan in many years was (in my view anyway) the 2008 vintage. Nearly all the 2008 I tasted over the past eight months were packed with fruit flavours, made ever more savoury by the vintage’s bright acidity. Alas, many of the 2008 whites are sold out now … but here comes Robert Van Westen (photo above). Never one to rush his wines, he has just released the 2008 whites from his Van Westen Vineyards. It is one more chance to taste that vintage’s terrific whites. The wines are all under screw cap, further preserving their freshness. There are three wines, all with labels beginning with V, a particular conceit at Van Westen Vineyards, and one that may prove limiting in the future, as when he releases his first Cabernet Franc as Vrankenstein, not a label I would expect to see on the table at, say, Bishop’s, however good the wine will surely be. One never knows, of course. Robert and Tammi, his wife, have a regular list of customers in the Vancouver area to whom they deliver their wines personally. This engaging couple could sell ice cubes in Inuvik. Selling V wines should be easy for them. Especially if they are selling the Van Westen Viognier 2008 ($24.90). Happily for Robert and for the rest of us, Viognier is a grape that begins with a V, grows brilliantly in the Okanagan and produces wines of distinction. The variety, unusual for a white grape, has a bit of tannin in the skins, resulting in wines with excellent structure. This wine is full on the palate, with aromas and flavours of apricots and tangerines. The bright acidity of 2008 turbocharges the fresh fruit flavours and gives the wine a crisp finish. Only 120 cases were released. 90. Van Westen Vino Grigio 2008 ($18.90) is Robert’s take on Pinot Gris. Only 333 cases were released. Here is another delicious white packed with fruit – ripe pears, peaches and papayas, with a hint of anise on the finish. Again, the bright acidity adds to the crisp, refreshing finish. 88. Van Westen Vivacious 2008 ($18.90) is primarily Pinot Blanc with a touch of Pinot Gris (230 cases released). Pinot Blanc can be a rather neutral wine but not when made by Robert Van Westen. A portion of this wine is barrel-fermented and aged on the lees, which were stirred regularly to enrich the texture and to add complexity to the crisp apple flavours. On the finish, there are stone fruit and mineral flavours, even a note of austerity. Definitely a food wine. 87-88. Had it not been for the arrival of samples on my door step, I might never have heard of the Yabby Lake Winery. It is one of the hundreds of Australian wineries created in the gold rush of that country’s winery proliferation in the 1990s. Since then, some have closed and others have been absorbed by conglomerate wine groups. Yabby Lake remains family-owned and, judging by the quality of the wines, will come through the current cycle in that industry successfully. What makes the wines exciting is the vineyard’s cool climate location on the Mornington Peninsula, about an hour south of Melbourne. This region has emerged as something of a playground for Melbourne’s wine lovers, with about 30 wineries in close proximity of each other. The Peninsula has emerged as one of the best places in Australia for Pinot Noir and Chardonnay. British wine writer Jancis Robinson, who was there for a tasting early in 2009, heaped praise on the wines of the peninsula. An Australian businessman named Robert Kirby was, in 1992, among the pioneers of viticulture on the peninsula. The Yabby Lake vineyard was planted a few years later. The Kirby family also planted a vineyard in 1999 at Heathcote, just north of Melbourne, a long established viticultural region in the state of Victoria. Here, they grow only Shiraz on some of the oldest soil in Australia. The resources to get into the wine business appear to have been generated by a business now known as Village Roadshow Ltd. It was started by the Kirby family in 1954 to operate drive-in theatres around Melbourne. It has grown into a substantial media company It operates cinemas, produces movies, and runs theme parks in Australia and in the U.S. Given their apparently deep pockets, the Kirby family has invested in top vineyard sites and has hired top winemakers and consultants to produce top-ranked wines. For example, one of their consultants is a New Zealand winemaker called Larry McKenna who has a stellar reputation as a Pinot Noir maker. For much of its wine history, Australia was not known for either Pinot Noir or Chardonnay. Prior to the 1980s, these varieties either were not grown or were grown in inappropriate terroirs. Who can forget the big, blowsy, over-ripe and over-oaked Chardonnays of that era? The Mornington Peninsula is great terroir for both these varieties. The wines are full of flavour, not too alcoholic and finish with the crisp, bright focus that comes from the lively acidity. The Yabby Lake wines are represented in western Canada by Renaissance Wine Merchants Ltd. of Vancouver. You might need that information since only one of the wines reviewed here is in the liquor store system. The others are all speculative listings; they are more likely found in private wine stores. They are all worth seeking out. Here are my notes. Cooralook Chardonnay 2008 ($17.99 in the LDB): Yabby Lake’s entry-level brand, this wine is an excellent value Chardonnay – crisp, refreshing, very subtly oaked so as not to mask the attractive citrus flavours. 88. Cooralook Pinot Noir 2008 ($20.38). Another good value wine, this tasty wine has flavours of raspberry and spice with the classic fleshy texture of Pinot Noir. 88. Yabby Lake Chardonnay 2006 ($42.82). This sophisticated, barrel-fermented Chardonnay is a complex blend of six clones of Chardonnay. The wine delivers laser-focused flavours of lime and lemon. The oak comes through as a subtle hint of hazelnut. Even though this is a medium-bodied wine, the abundance of fruit gives it a richness on the finish while the acidity gives it crispness. 90-92. Yabby Lake Pinot Noir 2006 ($50.98). Here is a full and satisfying Pinot Noir, an almost jammy wine with black cherry, spice and strawberry notes, with a hint of sweet mocha on the finish. 92. Heathcote Estate Shiraz 2006 ($42.82). Are you tired of soft, syrupy Australian shirazes? Then try a cool-climate take on the variety. The wine is dark, with aromas of spice and cherry. On the palate, there are flavours of currants, cherries and spice. The wine has a rustic earthiness to the finish (remember that it grew on old soils) and good acidity and structure, all part of the wine’s interesting personality. 90. The winemakers who work with the Vincor wineries in the Okanagan are among the most talented in the valley. But Inniskillin Okanagan’s Sandor Mayer (photo above) occupies a special place among that group: he runs the toy store. His colleagues all make wine with what you might consider the mainstream varietals – Merlot, Chardonnay and so on. Sandor also gets to work with those grapes but Vincor assigned him the additional task of working with some of the exotic varietals from its vineyards. These are released under the “Discovery Series” tag, almost always in small lot quantities. The ultimate objective is to test additional varietals in the Okanagan and then plant more acreage of the best. Sandor was assigned the job of making these wines several vintages ago, starting with a hugely successful Zinfandel. Other interesting varieties have now turned up on his crush pad. Judging from the current releases under this series, everything is a keeper. I would speculate that Sandor got the assignment partly because of his background in research and partly because he is a willing hard worker, as he proved when he got the job to redevelop what is now the Inniskillin Dark Horse Vineyard. 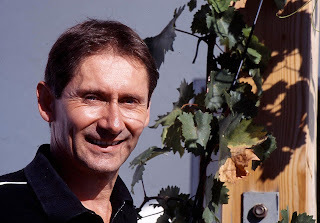 Born in Hungary in 1958, he began making wine at 14 with his father before getting a university degree in winemaking and viticulture. He went to work with Hungary’s major wine research institute and then moved on to a vineyard manager’s job in the country’s famed Lake Balaton region. When neither the salary nor the opportunities were adequate, he and his wife, Andrea (also a winemaker), slipped out of Hungary. After a year in Austria, an uncle in the Okanagan sponsored their emigration to Canada in 1988. The timing was bad. There were almost no jobs in British Columbia’s shrunken wine industry after two-thirds of the vines has been pulled out in 1988. Mayer took what he could get – a cellar job here, another one there. Finally, Alan Tyabji hired him in the summer of 1990 to replant the vineyard at what was then Okanagan Vineyards. This property, south of Oliver, had been the first estate winery in the south Okanagan. After it failed, it was acquired first by a car dealer and then in 1987 by Tyabji, a former Calona Winery executive. He was just in time to take advantage of the 1988 grape pullout program, when government compensated producers who pulled out Okanagan Riesling and other mediocre varieties. Tyabji pulled out everything in his vineyard. A couple of years later, when he was able to order premium vines from France, he hired Sandor to get the vineyard ready. The property was then an ugly tangle of wires, posts and dead vines. “Many times, I went up to the vineyard, looked at the big mess, scratched my head and went home,” Sandor recounted later. But he hung in there and gradually the Dark Horse Vineyard emerged, among other strengths, to be one of the finest Cabernet Sauvignon sites in the Okanagan. Inniskillin bought the vineyard and winery in 1996. Except for a brief stint at the Jackson-Triggs winery, Sandor has been Inniskillin’s winemaker ever since. Not everything that was planted at Dark Horse in the early 1990s was best for the sun-bathed site. Varieties better suited to in cool sites, such as Gewürztraminer, have been replaced. Several of the Discovery Series varieties now grow here: Marsanne and Rousanne, two Rhone whites, and Tempranillo, the Spanish red. Other grapes for the Discovery Series wines grow in various Vincor vineyards in the south Okanagan. Here are notes on the wines. Most are available only at the winery or in restaurants, although the winery surely will ship case-lot orders. Contact Audrey Silbernagel at 800.498.6211. Is there Nothing Sacred at Blasted Church? The newest release from Blasted Church Vineyards, Nothing Sacred 2007, is a milestone wine. It is the winery’s first full-out Bordeaux blend. It is also the wine that says that Richard Kanazawa (photo above), the winemaker who joined Blasted Church in 2007, has put his stamp fully on the portfolio. The wine also marks the beginning of other important changes that are coming here. The most noteworthy is that, next year, Blasted Church will begin offering its wines under new labels and in lighter (more environmentally friendly) bottles. Based in Okanagan Falls, Blasted Church began life in 2000 as Prpich Hills. New owners two years later changed the name, hiring Vancouver marketing guru Bernie Hadley-Beauregard for the re-branding. He came up with Blasted Church, a name inspired by an old church in Okanagan Falls that was moved there in the 1920s from a mining ghost town in the south Okanagan. The movers famously set up a charge of dynamite to loosen the building nails in what the locals soon called the blasted church. Even cleverer than the name were Bernie’s labels (see an example above) – lively caricatures that made the wines stand out in any wine store or restaurant table. The winery had a lot of fun with the labels. For example, in a bit of strategic flattery, the images of senior Canadian wine writers appear on the Pinot Gris label. The labels were an immense hit with consumers and played no small part in the growth of this winery into a 20,000-case producer. When the labels were rolled out, Hadley-Beauregard advised Blasted Church to revisit the branding in four years. For one reason or the other, it has taken an extra three years for this to happen – but happen it will, next year. No doubt, there is a market rationale for this. From the winemaking point of view, there is also a rationale: the wines of Blasted Church have become too seriously good for irreverent (pardon the pun) labels. At last two developments account for the continual improvement in the wines. First, Blasted Church has had professional viticulturists looking after its vineyards for several years. The current vineyard manager, Morton Serbon, who joined the winery last summer, is trained and experienced in Australian vineyards. Second, the winemaking regime has stabilized. Due to various unfortunate circumstances, the winery has had six winemakers since 2002. Even though all were more than capable, the style of the wines never quite settled down. Richard Kanazawa looks like a keeper. Born in Langley in 1972, he came to winemaking by chance. After a brief stint as a professional rugby player in Japan, he came back to Canada needing a job and got one delivering wines for Domaine de Chaberton. He studied food technology at the BC Institute of Technology, hoping that would springboard him into a winemaker’s job. When it did not, he went to Australia in 2002where he studied winemaking and worked with several wineries. Returning to Canada in 2004, he found a job at the Red Rooster winery. Before leaving that winery for Blasted Church, he made the 2006 Malbec with which Red Rooster won its first Lieutenant Governor’s Award for Excellence. In the 2007 vintage, he shared cellar responsibilities with winemaker Kelly Moss. Shortly after vintage, she moved to Ontario for family reasons. Richard got the 2007 whites into bottle and finished the 2007 reds. Since then, he has been the senior winemaker here. His 2008 white wines have been released for some months now. The Gewürztraminer (89-90), the Riesling and a blend called Mixed Blessings are sold out. Still available is a tangy, herbal Sauvignon Blanc ($18.99), fruity Pinot Gris ($19.99), underrated Chardonnay Musqué ($17.99) and the winery’s most popular aromatic white blend, Hatfield’s Fuse ($17.99). All of these score 88 to 90. For Hatfield’s Fuse fans, the winery is making about 6,000 cases from the 2009 vintage. The 2007 reds were finished very well. Nothing Sacred 2007 ($39.99) is a blend of 33% Cabernet Sauvignon, 33% Merlot, 23% Malbec and 11% Cabernet Franc. Individual parcels of fruit came from vineyards on the Naramata Bench, Oliver and Osoyoos as well as Blasted Church’s Skaha Lake Bench Vineyard. Each lot was processed separately and aged in new French oak. In the end, 216 cases of a fine hand-crafted wine have been released. It is an elegant and complex red with the spice of Malbec defining the aroma. On the palate, there are flavours of currants, black cherry, cedar and blackberry. This is a 91 point wine, perhaps more with a few years in the cellar. The winery’s Syrah 2007 ($25.99) is a generous wine with the classics notes that are beginning to define Okanagan Syrah – pepper on the nose and the finish, along with earthy, gamy flavours of plum and blackberry. 89. At a recent tasting Richard also brought a barrel sample of the Syrah 2008. This wine includes some Viognier in the blend. Perhaps that accounts for the additional elegance of what will be a very delicious wine when released. 90. The only 2008 red released so far is The Dam Flood ($18.99), a cheerful blend of 60% Merlot, 40% Lemberger, a juicy, quaffable red with flavours of plum and blueberry. 88. The winery has released 1,500 cases of this. Just about to be released is Pinot Noir 2008. The 2007 is still in the market for $25 and that’s fine because the 2008 needs another six months or so to begin showing its potential. At a recent tasting, Richard also brought along barrel samples of several exciting reds that are not yet finished. The Malbec Syrah 2008 (the sold-out 2007 vintage sold for $40) is a marvellous combination of Malbec’s coffee, plum and spicy notes with Syrah’s pepper and gamy flavours. 90. There were also promising barrel samples of Petit Verdot, Cabernet Sauvignon and Malbec from the 2008 vintage. Clearly, Blasted Church has good wine with which to launch whatever the rebranding will look like. This is my column in the current issue of the Deep Cove Crier, reproduced here for your interest. By sheer coincidence, two immigrant couples from Holland with economics degrees from rival Dutch universities and a former Dutch dairy farmer have just begun making wine in British Columbia. That brings to seven the number of wineries run by individuals of Dutch heritage, with a possible eighth in the wings. While there is a melting pot of many nationalities in our wine industry, this column zeroes in just on the remarkable Dutch collection. This winery, which will open its tasting room next spring, is on a hillside east of Kelowna International Airport. Ancient Hills is owned by Richard and Jitske Kamphuys (rhymes with compass). He is a graduate of the famous Erasmus University but he never practised economics. The couple came to Canada in 1992 to take up a rural lifestyle on an Okanagan apple orchard. In 2005 they tore out the trees, replacing over several years with 27,000 vines (Baco Noir, Pinot Gris, Gewürztraminer, Lemberger, Zweigelt and Pinot Noir). The first crush in 2009 was done in an attractive new winery, designed by architect Robert Mackenzie. The winery is in one of the Okanagan’s most historic vineyard areas. In the 1930s, Hungarian-born Eugene and Virgil Rittich pioneered the Okanagan’s first serious trials with vinifera grapes not far from Ancient Hills. The orchardists who previously owned the Ancient Hills property planted vines in 1944 after being encouraged by the Rittich brothers. A hard winter five years later killed most of the vines although 40 unidentified vines remain on the property. The current owners have uncovered a fair bit of the history. (250) 955-8600.) This Shuswap vineyard may be a few years away from opening a winery. However, owner Jake Ootes (rhymes with Otis) had another Shuswap winery make wine from his grapes this fall, allowing him to see what his vineyard delivers before investing in a winery. Jake was born in Holland in 1942 and came to Canada with his parents when he was eight. He has had a remarkable career that included being an assistant to the commission of the Northwest Territories, publishing newspapers and magazines in the north, and going into politics. He was the NWT’s minister of education before retiring and, with his wife Margaret, moving to a lovely farm on the north side of Shuswap Lake and planting vines. Echo Valley Vineyards (4651 Waters Road, PO Box 816, Duncan, BC, V9L 3Y2. Tel: (250) 748-1470. This winery was opened in 2003 by Alfred Brennink, a retired architect, and his son, Edward. This secluded property is worth the visit for its beautiful location. If you go, telephone first. Alfred, who bright his family to Canada in 1979, is returning to Europe and the winery has been for sale during the past year. The future for this winery remains uncertain. Fort Berens Estate Winery (PO Box 758, 1881 Highway 99 N., Lillooet, B.C., V0K 1V0. Tel: (250) 256-7788). This winery, which bills itself as Whistler’s local winery, opened in October on the site where the Hudson’s Bay Company started, and then abandoned, Fort Berens in 1859. The owners are Rolf de Bruin and his wife, Heleen Pannekoek, who emigrated to Canada last year with two young children. The couple met at the University of Groningen where both studied business and economics. She had a 15-year career with ING Bank and he was a successful management consultant. About five years ago, they made a lifestyle decision to leave the corporate fast track. Having vacation in British Columbia several times and being interested in wine, they chose to develop a winery here. They were getting discouraged at the price of vineyard land in the Okanagan when they learned of the grape growing trials on the banks of the Fraser River spearheaded by the former mayor of Lillooet. Late last year, Rolf and Heleen leased (with an option to buy) farm property. This spring they planted 20 acres of vines. They’ve opened with purchased Okanagan wine and they began making wine in 2009 with Okanagan grapes. Tel: (250) 765-0802.) Vern Rose, a native Albertan, started this winery in 1993. Due to ill-health, he sold the winery in 2009 to his daughter Aura and her Dutch-born husband, Wouter van de Hall. OVINO Winery (1577 Yankee Flats Road, Salmon Arm, BC, V1E 3J4. Tel: 250 832 8304.) John Koopmans, who was born in Holland in 1956 and came to Canada in 1977, got tired of dairy farming and planted a four-acre vineyard instead. The first estate-grown wines were made there in 2009 and he plans to open the tasting room in 2010 on this lovely rural property about 20-minutes from Salmon Arm. Sonoran Estate Winery (5716 Gartrell Road, Summerland, BC V0H 1Z7. Tel: (250) 494-9323. This winery was opened in 2004 by the Smits family, who came to Canada in 1981 and came to the Okanagan in 2000, initially running a bed and breakfast. Son Adrian, the winemaker, and his wife Sarah, are Sonoran’s public face. This winery has a good restaurant attached to its tasting room. Van Westen Vineyards (2800B Aikens Loop, Naramata, B.C. V0H 1N0. Tel: (250)496-0067. The Van Westen family has grown tree fruits near Naramata since coming to Canada in the 1950s. The winery, which opened in 2005, is run by Robert Van Westen (one of the sons) and his wife Tammy. The tasting room, in a corner of an old packing house, is only open occasionally. It is worth phoning for an appointment because Rob’s wines are among the best in British Columbia. With the release this fall of the first wines from Kelowna’s Sperling Vineyards, winemaker Ann Sperling (photo above) has re-connected with the Okanagan, where she first began making wine 25 years ago. But this is more than a story of the hometown favourite coming home after stellar success elsewhere. It is the story of fulfilling the dreams of Ann’s forebears, the Casoro family, pioneering Okanagan grape growers and vintners. As you will see from the tasting notes, Ann (her mother, Velma, is a Casorso) has done her family proud. The Casorso family came to the valley when Italian immigrant Giovanni Casorso arrived in 1883 to work for the Oblate Mission’s farm. Soon he had his own homestead near the mission, succeeding brilliantly as a farmer (he was Onion King one year). When tobacco was grown in the Okanagan, he was one of the largest tobacco growers. Perhaps it is a coincidence but the barn on the label of Sperling Vineyards wines looks a bit like a tobacco-curing barn. The family first got into the wine business when Rosa, Giovanni’s wife, and Pete, one of their sons, invested in the consortium that in 1931 launched what became Calona Wines. When the Capozzi family gradually bought control of the winery in the 1950s, Pete refused for years to sell his shares. “His pastime for many years was to go to their board meetings and raise hell,” Ann says. A family history credits Charles Casorso with planting the first Kelowna vineyard near Rutland about 1925. His brothers Pete and Louis ordered vines in 1929 and planted grapes on Pioneer Ranch, as the family property was known. It appears, however, the major crops grown here were apples until Pete retired in 1960, turning the farm over to his daughter Velma and her husband, Bert Sperling, who are Ann’s parents. Bert converted the entire property to grapes. Initially he grew the same hybrid and labrusca varieties that everyone else had before switching to Riesling, along with four hectares of Sovereign Coronation table grapes. Over the years he sold wine grapes to Calona, then to Growers in Victoria, and, in recent years, to Mission Hill. With food sciences degree at the University of British Columbia, Ann began her winemaking career at André’s Wines in 1984. She moved to CedarCreek Estate Winery in 1991 and was soon making award-winning wines. She moved to Ontario in 1995, began a career as a consulting winemaker. She made inaugural vintages for highly-regarded Malivoire Wine Company and currently is director of winery operations for Southbrook Vineyards, a rising Niagara star. The decision to reconnect with the Okanagan flowed from a family conference about the future of the vineyard. “It has always been in the back of my mind that I wanted to make wine here because I am so familiar with every foot and every slope and every grape on the property,” Ann says. In 2008, Sperling Vineyards got its toe in the business by making about 500 cases. In this vintage, production has risen to 1,800 cases. This year, the family intend to get a winery license and open a tasting room in Pioneer Country Market, a market and delicatessen that Ann’s mother has operated since 1985 on Benvoulin Road in Kelowna, not far from the Father Pandosy Mission. Meanwhile, Sperling Vineyards has been making its wine at nearby Camelot Vineyards. Ann also makes the wine for Camelot and for Clos du Soleil winery in the Similkameen Valley. Both are still relatively small producers and, as Ann points out, there is little overlap in the portfolios of all three of her British Columbia clients. Sperling Vineyards has debuted with five wines. Here are some notes. You might suppose that the Culinary Institute of America will never advise that one should locate a restaurant in Blood Alley in Vancouver’s occasionally rough Gastown. This is a dim alley with 10 (!) dumpsters at one end and, occasionally, individuals putting something into their arms with needles. Yet there, at 45 Blood Alley, is Salt Tasting Room. One of Vancouver’s funkiest little restaurants, it has been there for at least two years. A number of Okanagan wineries have hosted wine dinners here this year. The latest wine dinner, on November 30, featured Blue Mountain Vineyard and Cellars. A sold-out house sat on metal stools along both sides of the very long table in the Salt Cellar, sipping Blue Mountain wines paired with cheese and cold cuts. A simple, affordable and quite successful evening. This is a far cry from the annual events Blue Mountain used to have each January or February. These were toney charitable fund raisers in the ball room of one of Vancouver’s top hotels. Between 10 and a dozen top restaurants had stations around the room, preparing signature dishes paired with one of the Blue Mountain wines. The guests at those events, all in their finest dress, represented the Vancouver business and professional community. Most are on the winery’s coveted e-mail lists that inform clients of new wine releases. It would be hard to imagine most of them venturing past those dumpsters to Salt. The dinner at Salt, however, let Blue Mountain tap into a different and younger demographic, most of them probably not yet signed up to a place on an e-mail list. Congratulations for the Blue Mountain agent in Vancouver, Christine Fawcett, for doing what it takes to keep the Blue Mountain client pipeline full in a wine environment far more competitive that when Blue Mountain opened in 1991. As for the toney crowd, take heart: shortly after thus tasting, Blue Mountain announced that it is resuming its charity event with a $90 per person tasting at the Four Seasons in Vancouver at 6.30 p.m. on January 26, 2010. The format will be familiar: 10 top restaurants will offer signature dishes paired with Blue Mountain wines. Proceeds benefit the B.C. Childrens Hospital. Tickets are sold through the winery, at 250-497-8244 - and they sell out faster than Olympic tickets. The winery soon will have additional wines to show. In 2010 the winery will release the first addition to its portfolio since it opened. This fall, Blue Mountain harvested the first crop from a young Sauvignon Blanc planting. From what I hear, the tank and barrel samples are exciting. This is winery focussed on Burgundy and Alsace varietals. The flagship red varietal here is Pinot Noir. The only other red is Gamay. Currently, the winery produces three whites – Chardonnay, Pinot Blanc and Pinot Gris – and two excellent sparkling wines. The dinner at Salt featured several of these wines. All but two are currently available from the winery and possibly in such private stores as Everything Wine. 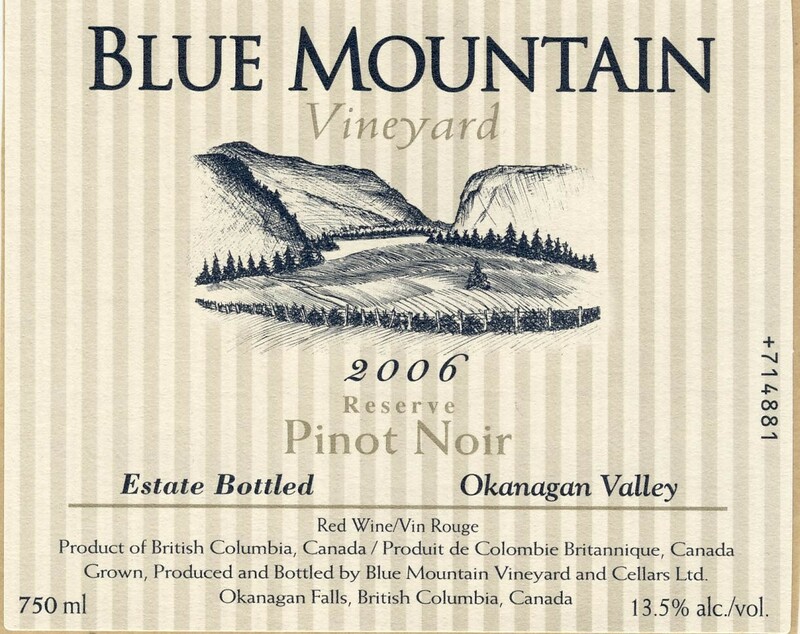 Blue Mountain Pinot Noir Reserve 1997 (N.A.) No doubt about it – this was the star of the evening. In 12 years, this has developed into a rich, silky red with flavours of mocha and strawberry. The finish is long and satisfying. I am often asked how long B.C. reds will age. Well, we have an answer with this Pinot Noir from Blue Mountain which is at its peak now.